Hasselbackspotatis. That’s the Swedish name for coolest way ever to cut, serve and eat a baked potato! Originally created at the Restaurant Hasselbacken in Stockholm, this beautifully sliced and fanned out spud is called the Hasselback Potato in America. For the life of me, I can’t quite figure out why they are not the most popular way to eat one of our favorite foods? It’s really pretty to look at, whether served plain with a little salt, pepper and sprinkling of parmesan and parsley, or fully loaded. It’s very easy to eat since the entire potato is cut in thin sliced before it goes into the oven. Plus, it can be enjoyed as a side, or a hearty dinner, depending on what you pour over it! For instance, the Hasselback Potato is perfect with a ladle of hot chili, cheddar cheese, sour cream and green onion slices! Or, with melted cheese and bacon bits. 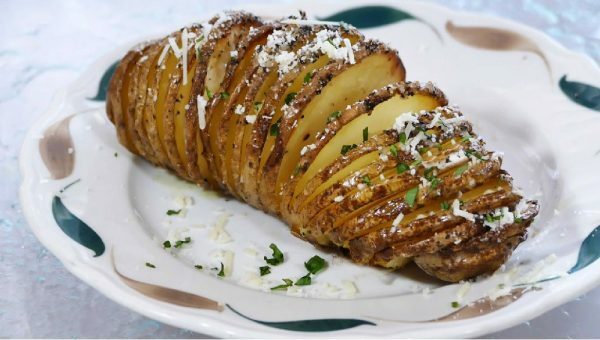 Years ago, the Hasselback Potato was a big trend as an elegant side in steak houses. But these days, many people have never heard of them. What a shame! They take the same amount of time as a baked potato and make a gorgeous presentation on a platter. Be careful when cutting the slices into the potato. You’ll make many slices, but only three quarters of the way down through the potato. It takes a tiny bit of practice, but if you take your time and do it slowly, you should have a perfect Hasselback that will fan out slightly during cooking. If you decided to put cheddar cheese slices in each cut, make sure you bake the potato first, then add the cheese during the last 5 minutes or so just to melt. I hope you love the recipe. Let’s make this potato hot again!